If you asked Wilfrid Laurier men’s curling skip Aaron Squires if he expected to be bringing home a bronze medal from the Canadian Interuniversity Sport (CIS) national championships, he would have said no. But the third-year communications studies student led his rink to a third-place finish at nationals in Regina, Sask. a month after placing second at the Ontario University Athletics (OUA) curling championships in Guelph. “We’re extremely proud of what we accomplished and couldn’t have really asked for much more,” Squires said. The performance is a major improvement for the Laurier program. The bronze-medal result is their best at a national championship since they won the gold medal at the inaugural event in 2007–08. 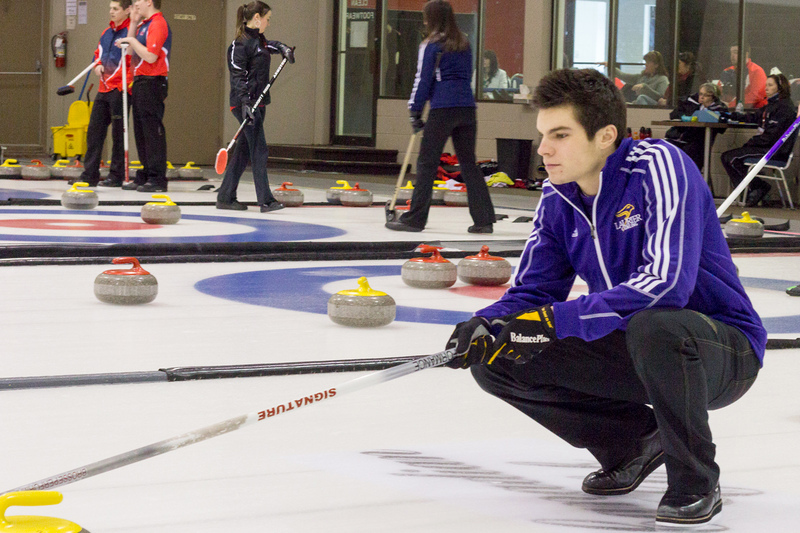 After finishing second in the OUA, Laurier started out strong at the CIS championship, going 6-1 in the round robin. The Hawks finished second in the standings to advance to the semifinal Saturday afternoon, but were upset by the Alberta Golden Bears 9-4 to earn the bronze. Two members of Laurier’s team were able to secure CIS all-Canadian honours after the round robin. Squires was named a first-team all-Canadian after having the best percentage shooting through the round robin of all skips. His vice, third-year Richard Krell, was named a second-team all-Canadian after the round robin. During the OUA championship, Krell stepped in as skip after Squires fell ill. However, he trusted his team as they clinched their berth to play at nationals. “I knew that my team is very capable of filling that void and Richard has skipped for many years now. So he was able to fill that void and switch the lineup around. And with a solid fifth, I knew that they had every chance of winning those two games and they got us a spot in the CIS. And I couldn’t really ask for much more than that,” Squires said. With the Hawks now in the offseason, the team will continue their fitness training while taking some time off to focus on next year. With one of their best seasons in the record books, the men’s team hopes to improve with all five players — Squires, Krell, second Spencer Nuttall, lead Fraser Reid and alternate John Gabel — returning next year. “We hope to repeat our win at OUAs and maybe win the actual banner. And obviously CIS gold would be quite possible and realistic, so that’s going to be the goal for next year,” Squires said.